Just a girl with a hammer: Flooring! In other big project news, after eight years(!) 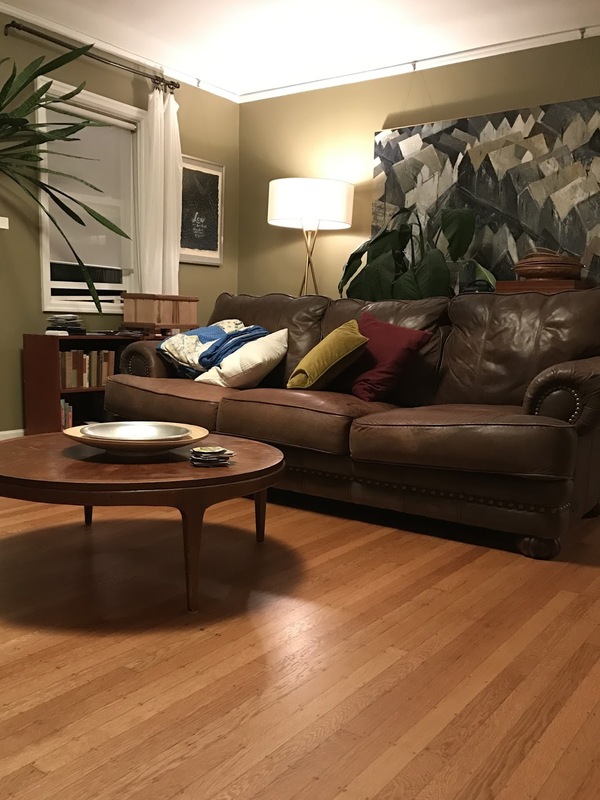 in the house, we finally got our wood floors refinished. It took this long because I couldn't afford it for years, then once we could I knew we'd have to move out of the house to have it done. We also had a huge question mark about the sloping subfloor under the carpet. We had no idea if fixing a creaky franken-floor would cost $500 or $5000. Just to recap, at one point our dining room was two rooms: a formal dining room (the side with the big window) and a kitchen nook that was 2/3 as deep as it currently is. The kitchen nook was bumped out to meet the front of the house and the wall between knocked down. They either ran out of money to finish out the oak flooring or got lazy? They put down plywood and slapped some carpet on top. The floor sloped and squeaked. When I moved in there was evidence of a previous roof leak (this wall is drywall when every other wall in the house is lathe and plaster and there was clearly damage to the ceiling), and the mouldings were all hiding in the garage. Anyhoo, we finally bit the bullet and hired Union Floor Co. In preparation I started cutting the carpet away from the wall so it could be easily rolled up the morning that work started. In the course of doing this I discovered past water damage and dried, inactivated mold. Yay! We are assuming this was from the previous leaking roof because why would you replace the plywood when you've had a leak and you could just put carpet on top? There were a couple of reasons that the floor squeaked. For starters, when they were nailing in the plywood THEY MISSED THE JOIST. So the plywood was sitting atop the joists in places. There was a particularly bad squeak that Greg would stand on and rock back and forth, just to drive me crazy, and I would think, "Oh that's why people get divorced after a year." It turns out that that squeak was caused by a nail that had been shot into our metal air duct. Every time we stepped in that spot the nail would scratch across the duct. Company that built this floor, I WOULD REALLY LIKE TO REVIEW YOU ON ANGIE'S LIST. We had deep gouges in the bedroom where someone dragged something heavy across the floor. 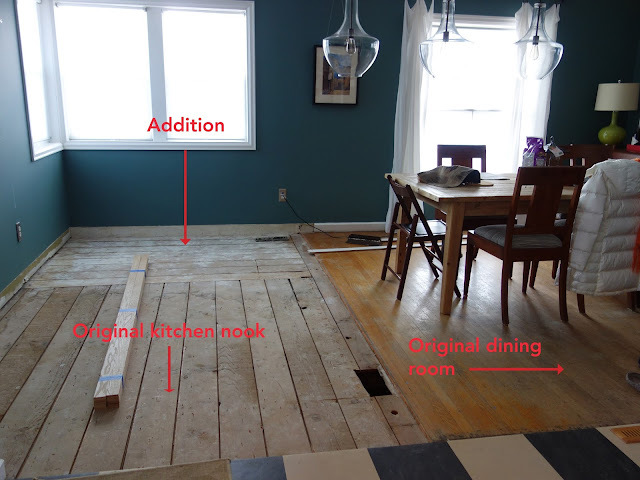 The dining room was leveled and patched with white oak flooring, as Siberian oak is no longer available. We moved everything into the basement and a POD outside and I decided that we are never ever moving because we have too much stuff. We moved out of the house for a week and into an Airbnb a block away. I was able to check in and be incredibly picky about how the floors were looking. The main worker kept saying things like, "The scratches aren't coming out in the bedroom but you lived with them before, so . . . " and then I'd feel like I was having a stroke. I had told the owner that we didn't care how much it cost, we wanted all the scratches and stains removed, either by flipping the boards or installing new boards. It was in our contract. We didn't move out of our house to "live with" floors that weren't fixed because it was more effort. I called the owner and asked him to clarify with his employee that we wanted them as perfect as humanly possible. We opted to seal the floors without a stain and they've assured me that the new white oak will patina to match the original Siberian oak. I'm skeptical, but my fingers are crossed. We did a satin finish, which is the least shiny option. Other than that, the floors look SO GOOD. We're very happy with the results. We're also totally exhausted from cleaning the house and moving back in. There was a fine layer of dust on every surface, requiring a wipedown of all the walls, counters, windows, etc. I'm going to be camped out here for the next couple of weeks, until my feet stop hurting.